CANBERRANS are being asked to report any sightings of Madagascan Fireweed, an invasive, yellow-flowering plant that quickly spreads through grazing land and makes livestock sick. The ACT Government has begun a targeted program to control the plant, which been found in the Gungahlin area, near Gungahlin Hill, Gungaderra, Mulangarri, Percival Hill, Mulligan’s Flat Nature Reserve and Mitchell Grasslands, according to Jane Carder, the manager of Place Management within Territory and Municipal Services (TAMS). 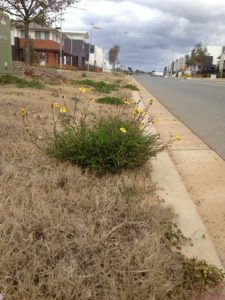 Ms Carder says anyone who sees the distinctive plant, which often grows by the side of roads, can report its location to Canberra Connect on 13 22 81, and encourages helpful weed-spotters to take a photograph for identification purposes. The TAMS weed management team is working with contractors to control the spread of Fireweek as quickly as possible by destroying the plant before it flowers. “Fireweed is a small multi-stemmed and vigorous flowering daisy-like plant with numerous bright yellow daisy flowers,” Ms Carder said. “Like other daisies, the weed produces fluffy, wind borne seeds. Some plants can produce tens of thousands of viable seeds, making it highly invasive. According to Ms Carder, Nipping the infestation in the bud would save the ACT significant expenditure in future weed control and protect native plants. Sightings of Madagascan Fireweed can be reported to Canberra Connect on 13 22 81.